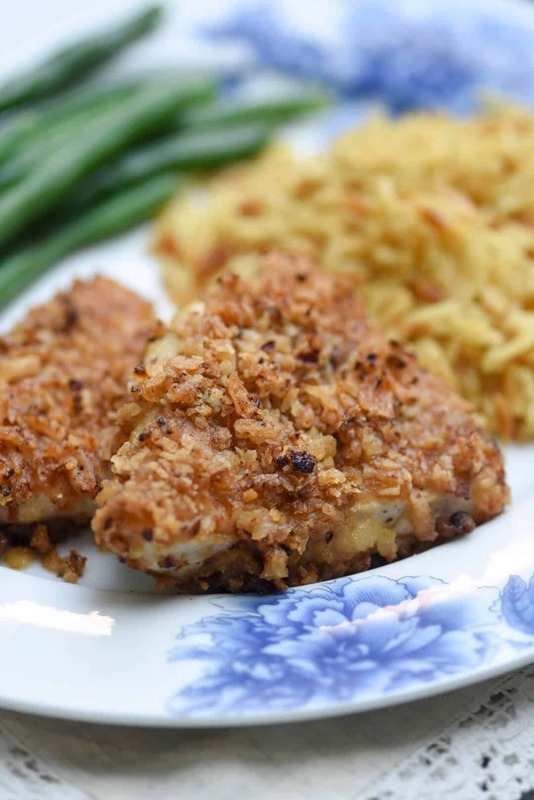 A delicious coating of French-fried onions adds big flavor to this Crispy Onion Chicken. 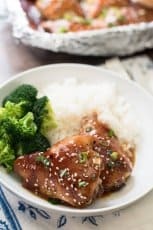 A super family-friendly meal idea! I had my very first encounter with French-fried onions recently. Most people are familiar with these tasty onions from all those years of consuming the classic holiday green bean casserole, a required dish on most Thanksgiving menus. But, alas, it was never part of my mom’s holiday repertoire so I managed to go all this time without ever once trying them. 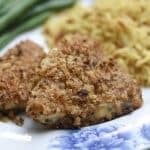 Then I saw a version of this Crispy Onion Chicken on Taste of Home and I knew I had to take this opportunity to give them a try. And, I must say, I was a bit wary but, WOW, they are pretty fabulous! And, they are also quite versatile. 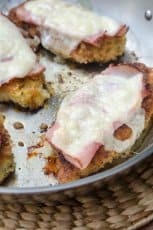 They’d be delicious tossed into salads or piled on top of a burger but in this recipe they are crushed, tossed with a little flour and used as a coating for chicken. 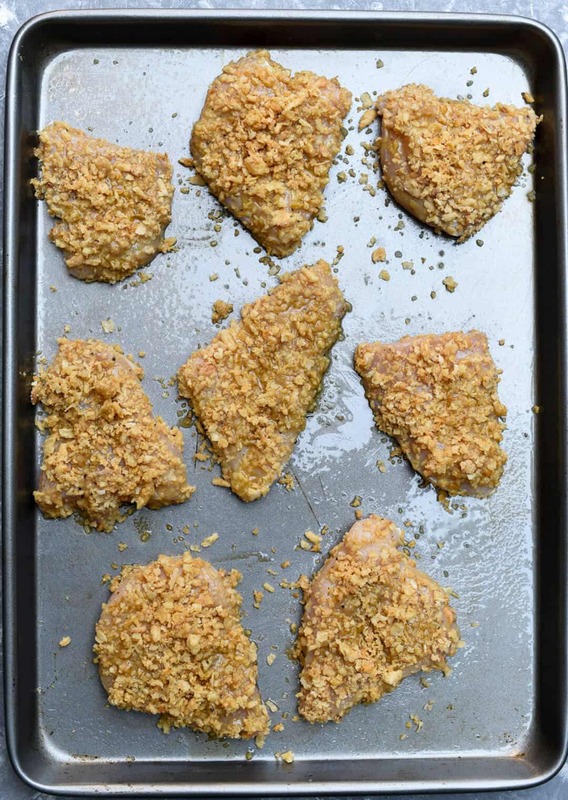 First, the chicken is dipped in an olive oil and butter mixture that includes Worcestershire sauce, Dijon mustard, and minced garlic and then it’s dredged in the crispy fried onion coating and baked on a rimmed baking sheet. The resulting chicken is golden brown and crispy on the outside and super tender on the inside. So, so good! 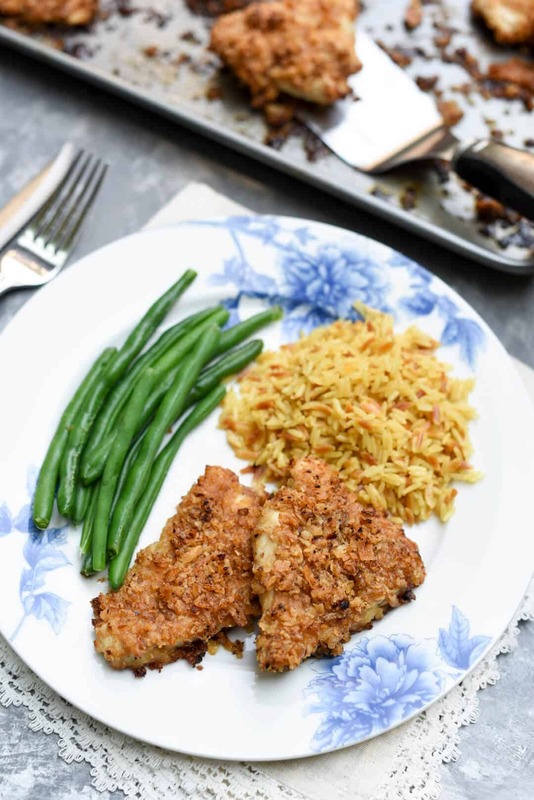 I served it with rice pilaf and fresh cooked green beans for a simple, comforting meal. I know that so many of you are in the throes of Back to School time and that plate up there is SO much like something I’d have made for my boys at this time of year. 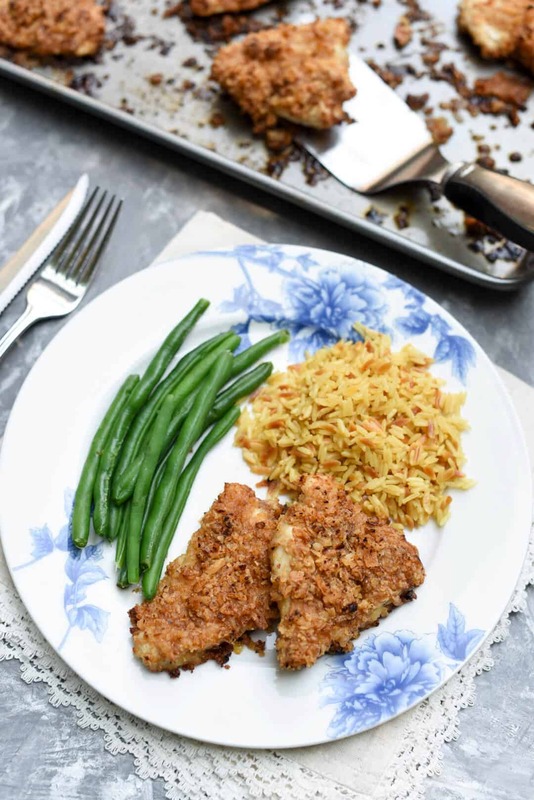 There’s nothing like a simple and tasty kid-friendly meal like this one to soften the blow of summer coming to an end. But, I have to tell you, my grown guys loved it! For more simple dinner recipes, check out all of my 30 Minute Meals and One-Pot Dinner ideas! Preheat oven to 375 degrees F. Generously coat a large rimmed baking sheet with non-stick cooking spray. Bake for 20 to 25 minutes or until thoroughly cooked and no longer pink in center. Cooking time will depend on thickness of chicken. I found the French-fried onions in the canned vegetable aisle at the grocery store. Not sure what plug in you are using but when you hit the print button it fails to load page. One time it loaded but no picture. This looks very yummy and cannot wait to try it. This looks delicious and I’ll definitely be giving it a try! Is there a recipe for the rice pilaf? We love this Almond Rice Pilaf! It sounds easy to try. Thank you for sharing the recipe. My kids will definitely love it. want to try this with chicken thighs,,,thoughts, please…? Hi Dina. I think it would work fine but my preference for this recipe would be boneless breasts. Let me know how it works out for you! Awesome recipe!!! I mean this was delicious, and SO easy to make. What would you recommend this to go with?? QFC has this on the frozen food dept, and undusually has an apricot chutney that go with it (and is sooo good)! Any suggestions? I’m happy you loved it, Alexandra! 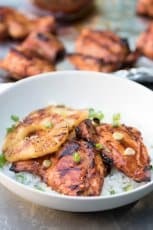 I like to serve this with a rice dish like my Almond Rice Pilaf but it would also be delicious served with mashed potatoes. I also include a simple veggie side dish like broccoli, green beans, or roasted sweet potatoes. Made this tonight. 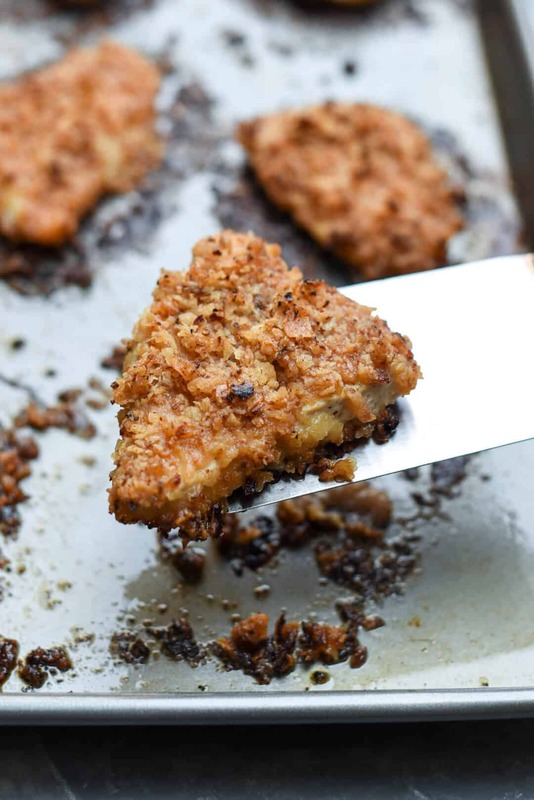 Probably the best baked chicken recipe EVER! 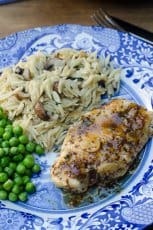 Chicken was moist, tender and flavourful!